Clem Gryska was a Stubenville, Ohio native who came to Tuscaloosa in the late 1940s to play for the Crimson Tide and became a fixture in the school's football program and athletic department for almost a half a century. Gryska lost most of his right hand in a childhood accident making him ineligible for service in World War II. Instead he became a blocking back for Frank Thomas' famed "War Babies" squads. He was a freshman on the undefeated 1945 team that claimed the SEC championship and trounced USC in the 1946 Rose Bowl. 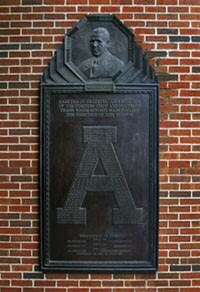 Under coach Red Drew, Gryska was moved to end where he earned letters in 1947 and 1948. Following graduation, Gryska coached high school football in the state but returned to The Capstone in 1960 as an assistant under Paul Bryant. He was the Tide's freshman coach as well as recruiting coordinator until 1976 when he was promoted to Assistant Athletic Director, also under Bryant. After stepping down in 1993, Gryska became the director of the Paul W. Bryant Museum until his retirement in 2010. Gryska passed away on April 23, 2012 at the age of 83.